The role of the Society for Italian Studies (SIS) is to further the study of Italy, Italian language, literature, film, thought, history, society and arts in the United Kingdom and Ireland. It represents the discipline, providing a voice for Italian Studies at national and international level and participating in the work of the University Council of Modern Languages (UCML) to promote the study of Modern Languages. It supports research through the work of its journal, Italian Studies; through its biennial and interim conferences; through its grants for conferences and for collaborative research projects; through its support of the post-graduate community; and through its involvement in national and international research exercises. It works to ensure that all areas of Italian Studies are connected and it encourages collaboration with the subject associations of cognate disciplines, with other societies and institutions that promote the study of Italy, and with the cultural organizations of the Italian State. The SIS supports the teaching of the Italian language by providing a forum for language teachers, and through its annual conference on language teaching. 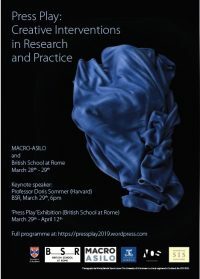 It promotes connections beyond the Higher Education sector, and aims, through its work, to encourage the dissemination of the expertise of all Italian departments in the UK and Ireland. The Society for Italian Studies is a registered charity (no. 313786), and it is regulated by a Constitution.